Guernesiais, Guernsey French or Dgernesiais, is the original language of the island. You can see it on the sign above, in Guernsey‘s capital, St Peter Port. It is, sadly, dying out now, although Remus Carey is a native speaker. As a man in his mid 50s at the start of book one, Dead in the Water, he is unusually young for someone who was brought up primarily speaking Guernesiais and using English as his second tongue. All of Remus’s logs are written in this language, which has many similarities to modern day French thanks to their shared heritage. Miles Bichard tasks Christine Le Page with translating them into English. Despite his love of the language, Remus didn’t bring up his son, Ollie, speaking the language, choosing instead to teach him English first. As a result, Ollie’s command of the language is almost non-existent, and when he needs assistance translating some of his father’s notes in book 2, Blowfish, he turns to his friend Simon Langlois who knows the basics. Use of Guernesiais was more common before the Second World War, and there was considerable variation between the upper and lower parishes with regards to pronunciation and even some of the words used. However, many of the island’s children were evacuated to mainland Britain in advance of the German invasion and, when they returned, their understanding of the language had been lost. It has never recovered in the years since, although during the occupation it was used by many who had been left behind on the island as a means of conducting conversations without being understood by the enemy. A census taken in 2001 showed that just 3% of the population understood it, but that almost three quarters of these were in their mid-sixties or older, so it is very much a dying tongue despite efforts in the island schools to revive it and the formation of a Guernsey Language Commission, which started work in May 2013. It is often known on the island simply as patois and it shares many common features with Jerrais, spoken on neighbouring Jersey. Both have Latin roots. However, it has faired better than Auregnais, the native language of Alderney, which is now considered extinct except for its use in some place names and family names. Sercquiais, from Sark (it’s also known as Sark French or Sarkese) is a largely verbal language, rarely committed to paper, and spoken by very few (Sark’s population is far smaller than that of Guernsey and not all of the residents understand the language). 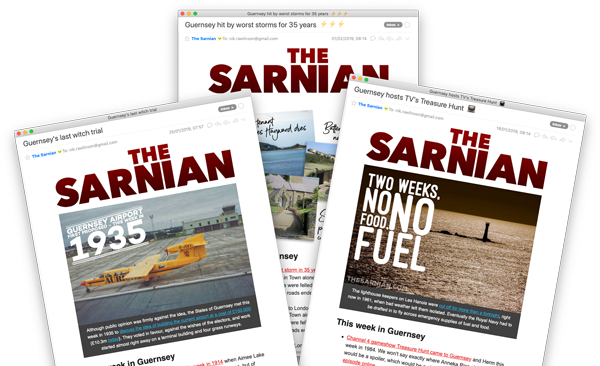 Guernesiais appears in The Sarnian, the explosive adventure series in which the discovery of a dead body on one of Guernsey's most secluded beaches blows the lid on a world of intrigue and deceit. Guernesiais is the native language of Guernsey, although it is no longer widely spoken. It has its roots in Latin and French. Remus Carey has it as his first language, with English a close second, having been brought up in a Guernesiais-speaking household. He uses it to write all of his logs on board the Huffin’ Puffin. 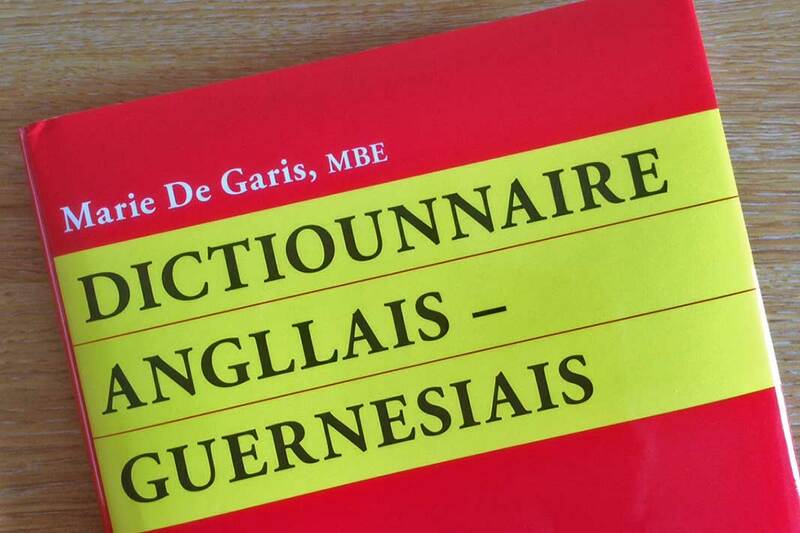 The most extensive and valuable work on Guernesiais is the Dictiounnaire Angllais-Guernesiais compiled by Marie De Garis in 1982 and now on its fourth edition. It provides a comprehensive English to Guernesiais translation with a lot of background information on island life and customs through history. De Garis received an MBE for her work. Considerable effort is being put into saving Guernesiais from dying out altogether with the local schools running classes and evening and lunchtime courses running for the benefit of adults who want to learn it themselves. Mes Prumieres Paroles en Guernesiais by Harry Tomlinson is an illustrated beginners’ book originally written for use in Forest Primary School’s language lessons. The British government considers Guernesiais to be a regional language. Succulent plant that grows abundantly on headlands.